As one of Britain’s best-selling gardening magazines, BBC Gardeners’ World provides advice from leading professionals, inspirational looks at gardens and how-to guides to make your own outdoor oasis.The magazine companion to the BBC TV programme of the same name, BBC Gardeners' World features indispensable Q&A sections to help readers troubleshoot their gardening issues. From getting rid of pesky insects, to the best compost to use, BBC Gardeners' World is there to help. Similarly, if you are unsure where to start when it comes to bringing your garden to life, there are detailed features on inspirational gardens designed to get you going. Well-loved gardening faces such as Alan Titchmarch and Carol Klein are regular contributors to BBC Gardeners' World, offering up handy hints and tips for every gardening season. 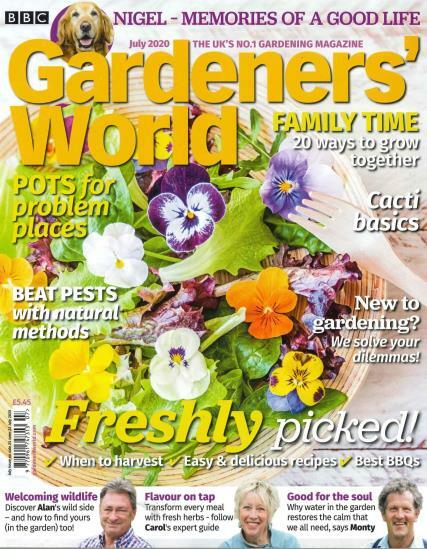 Gardeners' World is a magazine which prides itself on belonging to its readers, and as such encourages feedback in order to become part of the BBC gardening community. Excellent magazine. Easy to read and full of practical tips on all aspects of gardening. Gardeners world – I love this as it gives me a monthly guide to what jobs I should be doing in my garden, with lots of articles and bright clear pictures of each task. It has lots of info from readers, and beautiful gardens with details all about them. I really love the end story – by Alan Titchmarsh.